“Remote sensing” is a generic term for monitoring techniques that collect information without being in physical contact with the object of study. Overhead imagery from aircraft and satellite sensors provides the most common form of remotely sensed data and records the interaction of electromagnetic energy (usually visible light) with matter, such as the Earth’s surface. Remotely sensed data are fundamental to geographic science. The Eastern Geographic Science Center (EGSC) of the U.S. Geological Survey (USGS) is currently conducting and promoting the research and development of three different aspects of remote sensing science: spectral analysis, automated orthorectification of historical imagery, and long wave infrared (LWIR) polarimetric imagery (PI). For more information, please contact author. 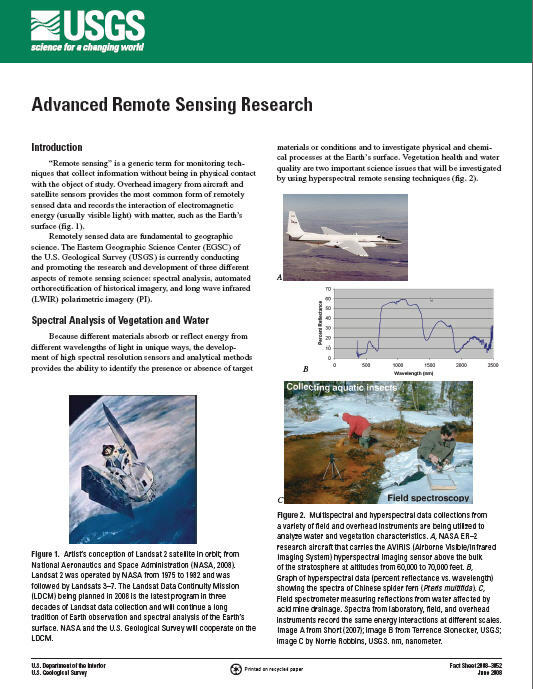 Slonecker, Terrence, Jones, J.W., Price, S.D., and Hogan, Dianna, 2008, Advanced remote sensing research: U.S. Geological Survey Fact Sheet 2008-3052, 4 p., available only online. This document is available online only in Portable Document Format (PDF); the latest version of Adobe Acrobat Reader or similar software is required to view it. Download the latest version of Acrobat Reader, free of charge or go to access.adobe.com for free tools that allow visually impaired users to read PDF files.